Prepare your mind now because in this top outdoor TRX class, you’ll get a full body blast with heart-pumping, body-toning exercises in just 30 minutes. This class is a compilation of some of Trainer Brooke’s favorite TRX exercises that’ll leave you feeling strong and accomplished. It’s the perfect workout for the park, especially as we head into the warmer months, but it can also be done anywhere you have an anchor point, so you can totally do this one indoors too. Let’s have some fun and get it done! I just got TRX for my home gym so I was really excited to see this new class! Adding to favorites. Thanks!! I finally got a good anchor point in my house so I was glad to try it out with Brooke. I’m still a novice at TRX so it always takes me a while to get my feet in the handles but I’ll get better. Hey combo queen 👑 this class is so fun !! Thanks for taking me to sunny SD to work with my favorite tool !! Oh yes we can! This is a wonderful full-body TRX workout that can be done anywhere. Nothing too crazy but do I know that I have been worked. Easy adaptations for two ‘wide’ moves so don’t let your space hold you back. 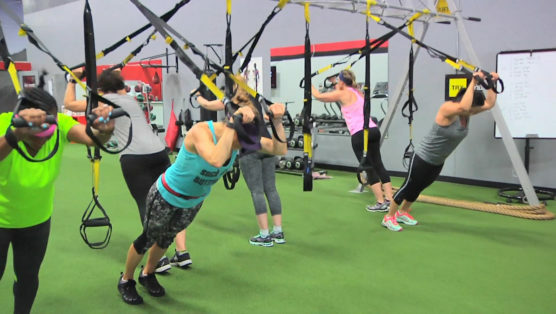 This awesome TRX workout is fast paced, but with perfectly planned work to rest periods. The rests are much needed to re-charge so you can attack the working phases! After a quick 5 min body-weight warm up, it’ll be time to hit that TRX for some full body strength & cardio exercises. You’ll complete three, yup three, killer 7 minute sets, which are broken up into 30 second intervals battling back and forth between strength and cardio. The net result… lean sculpted legs and arms, plus a beautiful back! Good stuff. Got 30 minutes to get SWEATy?? Then this is the class for you! Tabata TRX hits every major muscle group and some muscles you don’t even realize you are working. BONUS!! Your “rest” is a working rest! Grab your get it done attitude and a towel! You are gonna need it! Grab your TRX straps, and get ready for a well deserved total body stretch. The TRX will allow you to get deep into those stretches and lengthen the muscles, by letting you work in a greater range of motion. We’ll start with the back, legs, and glutes, then we’ll move onto opening up the often missed chest, arms, and shoulders. Go on, hit play – you deserve it. Short on time, but need to get in a good sweat and tone that body? Yes, let’s do this. In this TReXpress® workout, Brooke takes you through a killer superset that will leave you feeling WORKED. That’s right, sweat dripping, heart pounding, and an awesome feeling of accomplishment. Grab that strap and get to it. YEAH!! !